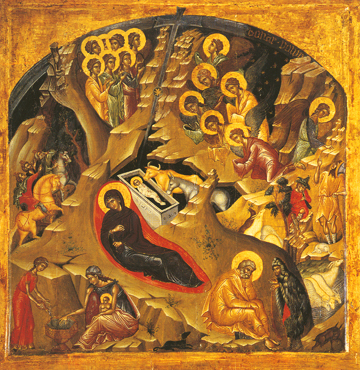 The Lord’s Nativity is shown in this 15th century Greek icon. It pleased God to send His Only-Begotten Son and Eternal Word into the world to become Man, and thereby teaching us of God’s love for mankind through Christ’s suffering, dying, and rising from the dead for our salvation. The Lord Jesus was born in a humble cave in Bethlehem of Judea. Only the Virgin Mary was present in the cave at His Birth. No one besides the Virgin and St. Joseph the Betrothed knew of this miracle surpassing all miracles but a few poor shepherds, who had been told by the angels, and the three Magi from the East who had been led there by a star. The Magi found the Lord where He rested and brought Him gifts of gold, frankincense, and myrrh. As St. Athanasios the Great says, “God became Man so that man could become God,” but this is not by nature but by the gift of grace. Here in this icon the Virgin is just outside the cave where the Lord lays inside near the animals. The Star shines above, Jesus is washed off by midwives, St. Joseph wrestles with his thoughts below, and the angles stand and bow in love and worship, for Christ is Born! Glorify Him!